What if Du Bois’ Talented Tenth Replaced Isolation With Hope? Theodore R. Johnson is a writer and naval officer who describes himself as an “upper-middle-class black male.” He recently claimed in The Atlantic that an unintended consequence of a burgeoning group of “college-educated, middle-class black folks”—whom W.E.B. Du Bois called the Talented Tenth—has been their break from the wider black community while still not being accepted by the white majority. To Johnson, this plight is a bleak, no-man’s-land. Johnson encases his lonely statement of betwixt-and-between-ness in a concept used by Du Bois in 1897: double consciousness. Johnson recalls being teased as an “Oreo” by black folks bused in from the “other side of town.” Plus he was called “a raisin in a bowl of milk” in honors classes as well as in the suburban area in which he was raised. If he says that was his experience, I’ll take him at his word. Yet Du Bois’ description was based on the legal, material and social restrictions imposed by the “gaze” of white supremacy. Johnson’s updated version, instead, involves an insecure feeling of tacit rejection by fellow blacks as well as whites, and psychic angst arising from a belief that you don’t fit anywhere. For the sake of argument, let's say that indeed some, even many, black folks who've succeeded in career and financial terms feel anxious and uneasy because of remaining social divisions based on race, compounded by education and class status. Even so, I contend, there are better ways than complaining about eternal insufficiency, like a black Sisyphus tasked with the responsibility to rescue “my nation from its problem and my race from itself,” yet withering under the weight and failing time and time again. 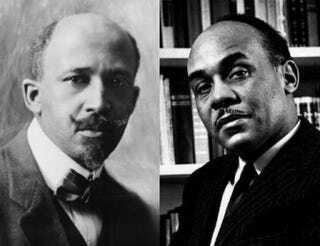 Note that Du Bois and Ellison both point to culture as a key aspect of the struggle and our advance. For Ellison, our black American cultural expression was best exemplified by the blues and jazz, musical representations of hope amid sorrow that project our improvisational, tragicomic attitude toward life. Ellison—who via the work of scholars such as Danielle S. Allen, Lucas Morel and Timothy Parrish is finally being recognized as a great 20th-century American political theorist and civic statesman—never shied away from the harsh facts of our sojourn in the U.S. Neither should we. But how we frame today’s issues can point to strategies to confront the pain and struggle of black folks as cited in statistical studies which reveal just how far we have to go to fulfill our nation’s democratic ideals. To face our 21st-century struggles, don’t we need writers to identify problems as well as provide a vision of possibilities and solutions? As the Bible says, without vision, the people perish. Writers provide vision. A paraphrase of a quote from Ellison’s The World and the Jug fits: You are no mere product of your sociopolitical predicament, Mr. Johnson. You are the product of the interaction between your racial predicament, your individual will, and the broader American cultural freedom in which you find your ambiguous existence. Greg Thomas is a jazz writer and frequent contributor to The Root. Greg Thomas is a cultural journalist and frequent contributor to The Root. Follow him on Twitter and Facebook.